The following remains as an archive of the issue. In dense urban settings, homeowners and renters coexist with businesses, institutions like schools and hospitals, parks, infrastructure and so forth. It requires a delicate balance to maintain a vital, livable, and attractive neighborhood for everyone. Growth and development are constant threats to that balance. At the same time, growth and development are necessary for the continued vigor of the community. The Highland Park area of Rochester is obviously not the only neighborhood facing the pressure of a growing medical complex. Of course, no two situations are the same. But there are some clear parallels and insight to be gained by examining comparable situations in other cities. Methodist Hospital is a large facility located in densely-populated and highly-desirable Park Slope, Brooklyn. The neighborhood is a landmark-designated district comprised largely of 19th century brownstones and borders Frederick Law Olmsted-designed Prospect Park. Methodist Hospital has proposed a massive expansion, with a new building height almost three times the height of 99% of the surrounding neighborhood buildings, and a new three-level parking garage with 1000 spaces. The construction could take as long as four years, and will require the destruction of at least 15 period buildings the hospital has collected over several years. Preserve Park Slope is a community organization opposing the size and scope of the project. Their website contains a lot of detailed information about the project and its history. You can also read more about it here, here and here. According to NorthJersey.com, "As The Valley Hospital has struggled for years to expand its campus in Ridgewood, it has been quietly buying real estate in Bergen County." Some of the purchases have been made through holding companies. Neighbors are vigorously opposing the expansion. Read more here. In 2010, Miami Valley Hospital completed a 484,000 square foot, 12-story tower. 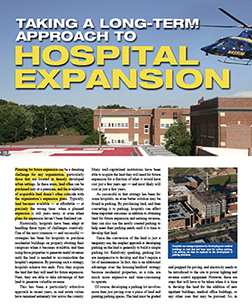 The expansion allowed for 98 percent of the hospital to contain all private patient rooms. In 2011, despite vigorous opposition from the neighborhood residents, which you can read about here and here, and watch here and here, Miami Valley Hospital was allowed a zoning variance to build a new parking lot. In 2013, the hospital announced staff reductions as it closed down some functions and consolidated others. Highland Hospital has done both. In 2012, the hospital purchased land on South Avenue slightly north of the main campus. It built a parking structure there over the objections of the neighborhood, receiving a zoning variance from the city to do so. And just months ago, it purchased a home at 27 Bellevue Drive.